Arthur Tudor was born to Henry VII and Elizabeth of York at St Swithun’s Priory, Winchester on 20th September 1486. He was named after the legendary King Arthur to reinforce the lineage of the new Tudor dynasty. He was created Duke of Cornwall on the day he was born. The young prince was baptised on 24th September at Winchester Cathedral by the Bishop of Worcester. His god parents were: John de Vere, 13th Earl of Oxford; Thomas Stanley, 1st Earl of Derby; William FitzAlan, 16th Earl of Arundel; Elizabeth Woodville and Cecily of York. Prince Arthur began his education at the age of 5 years and was educated by John Rede, former head of Winchester College. Later, he was educated by Thomas Linacre a Humanist scholar and physician. He was taught ethics, grammar, history and poetry. He was also able to read and write in Greek and Latin as well as being an excellent archer. In March 1489 the Treaty of Medina del Campo agreed terms for the marriage of Arthur to Catherine of Aragon, the youngest daughter of Ferdinand and Isabella of Spain. On 29th November Arthur was created Prince of Wales and Earl of Chester. His formal investiture as Prince of Wales took place on 27th February 1490 at the Palace of Westminster. In 1491 he became a Knight of the Garter. In 1497 an amendment to the Treaty of Medina del Campo set out the details for the marriage of Catherine of Aragon to Prince Arthur. 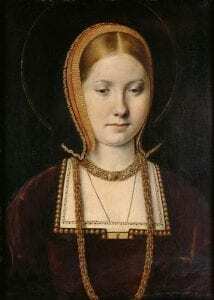 Catherine was to come to England when Arthur reached the age of 14 years. Her dowry of 200,000 crowns would be paid in three instalments, half within ten days of the marriage and the remainder paid in two equal instalments over the next two years. Catherine would retain her rights of succession to Castile and Aragon. Arthur’s bride arrived in England in October 1501. Impatient to see her, Arthur and his father, Henry VII, rode to intercept her party on the road to London. They reached her party in the evening of 4th November and Arthur was relieved to see that she was pretty with blue/grey eyes and long red/gold hair. She was about six inches (15 cm) taller than Arthur who was thin with a pale complexion. After supper Catherine showed Arthur a Spanish dance while he showed her an English dance. 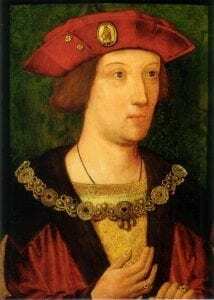 On 14th November 1501 at the age of fifteen, Prince Arthur married sixteen year old Catherine of Aragon in St Paul’s Cathedral. There ceremony was conducted by the Archbishop of Canterbury Henry Deane who was assisted by William Warham, Bishop of London. Arthur wore a suit of white satin while Catherine wore a white dress in the Spanish style with bell sleeves and a pleated skirt over a farthingale. She wore a headdress of white silk edged with gold and set with pearls and precious stones. Catherine was ‘given away’ by Prince Henry. The couple took their vows on a raised platform six feet high which ran the length of the nave. After the ceremony wine ran freely in the streets and the bells of London rang out. A wedding banquet was held at Baynards Castle and after the banquet there was dancing. At the appointed time the couple were publicly put to bed and the bed was blessed by the Archbishop of Canterbury and the Bishop of London. The following morning Arthur boasted “I come out glad this morning for I have been, during the night, six miles into Spain”. The wedding celebrations included jousts, banquets, pageants, disguising and dancing and continued for two weeks. On 21st December Arthur and Catherine left London and travelled to Ludlow Castle in the Welsh Marches where they were to form their own court. Catherine travelled by litter wrapped in furs while the rest of the party travelled on horseback. 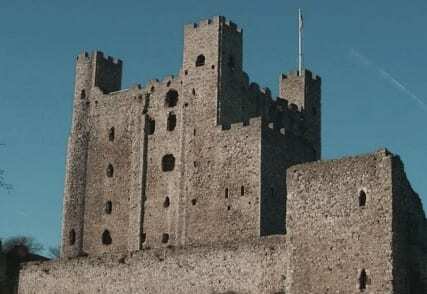 They reached Ludlow early in January and set about making the castle warm and hospitable. Soon after their arrival they were visited by the Welsh magnates. Rhys ap Thomas placed both himself and his son at their service. Rhys’s son, Gruffydd was appointed Catherine’s gentleman usher. At the end of March 1502 both Arthur and Catherine were taken ill with a viral infection, possibly plague or sweating sickness. On 2nd April Arthur died. Messengers were immediately sent to the King. Arthur’s body lay in state at Ludlow and was viewed by many of the English nobility. On 23rd April his body, which had been embalmed, was taken to the parish church of Bewdley for the funeral service. The earl of Surrey was chief mourner and represented the King. Many nobles of England and members of Arthur’s household attended the service. Catherine, as royal tradition dictated, did not attend the funeral service. After the service Arthur’s body was taken in procession to Worcester for burial. Gruffydd ap Rhys rode ahead of the black-draped hearse. His horse was draped with black cloth which bore the Prince’s emblem reversed. As the coffin was lowered into its own chantry in the Abbey of St Wulfstan in Worcester, the Prince’s chamberlains, Sir William Udell and Sir Richard Crofts, broke their staves of office and threw them onto the coffin.